Back in the early eighties, when Sid Knight took out a copyright on his Dog Nobbler flies, local anglers to Rockbourne Fishery at Fordingbridge soon found that something very similar was taking trout like nobody’s business, without the need to fish with a crash helmet as those Dog Nobblers were lethal things to cast. This fly was weighted by a length of lead wire (0.37mm) wound onto the entire shank of the hook. Best fished on a fast retrieve on a slow Sinking Line, this fly will take trout all year round. Knots should be tidy,trim them so there is no more than a millimetre or two of line sticking out from the knot. Rib : Silver or gold ovals. Body : Fluorescent or rayon chenille. Head : Twisted peacock herls to form a generous sized head. A variety of colours can be used, chiefly black, orange, white or yellow. Longshank. 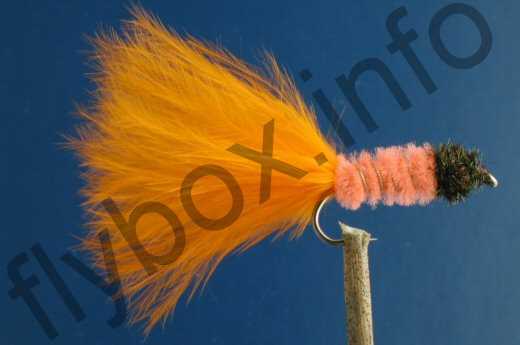 Currently there are no comments about the Hern's Orange Wobbler fly pattern from other fly fishermen yet.